A lengthy profile of the W. J. Armstrong family, gleaned from The History of Mendocino and Lake Counties, is here. The Armstrong house about 1900. 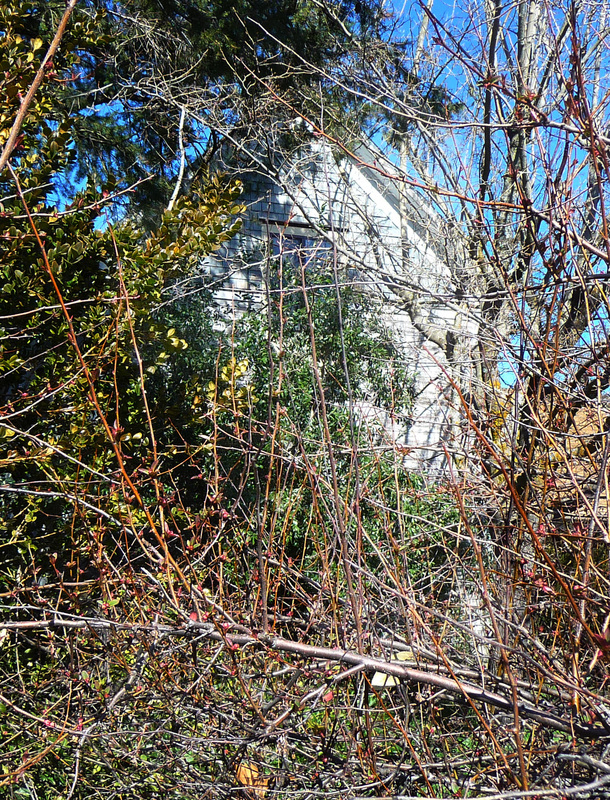 Well hidden behind a fence of thicket on Wardlaw Street was a house that was doubtlessly the oldest in Middletown — until it and most of its neighbors was destroyed by the Valley Fire in September 2015. It was built by William Jasper Armstrong, who with his wife Anastasia had been one of the earliest purchasers of land on the Callayomi grant. The deed to W. J. Armstrong is dated October 1, 1870. 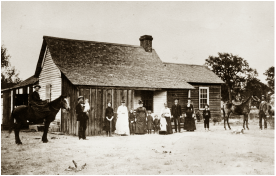 At least ten pioneers had purchased Callayomi parcels three days earlier – see Founding Middletown – but the Armstrongs were undeniably among Middletown's founders. The Armstrongs' parcel was bounded toward the north by the confluence of St.. Helena Creek and Putah Creek and originally extended to what is now Main Street in Middletown. William J. 's uncle Oscar Armstrong in partnership with John Henry Berry had purchased adjoining land to the south. They soon purchased 40 acres from young William Armstrong, and a similar amount from the acreage of the Parrott family to the west, to expand the plot allotted for the town of Middleton, renamed Middletown in 1875. Construction of the house is believed to have been started in 1870. Berry had built the first house in Middletown, but it was short-lived. It is probable that no house older than the Armstrongs' has survived into the 21st century. The property is now owned by David Neft, who has a strong respect for history, but says he would love to sell it to someone who could afford to restore it to the level it deserves. Gibson will put that on our someday list. The Times Star historical edition for Middletown Days 1996 carried a the-current photo of the house. 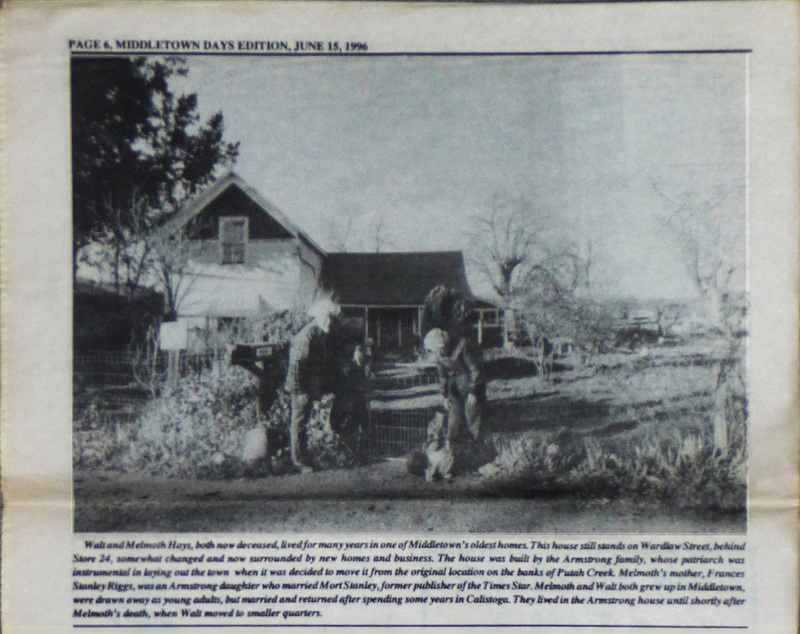 Its caption reads: Walt and Melmoth Hays, both now deceased,lived for many years in one of Middletown's oldest homes. This house still stands on Wardlaw Street behind Store 24, somewhat changed and now surrounded by new homes and businesses.The house was built by the Armstrong family, whose patriarch was instrumental in laying out the town when it was decided to move it from the original location on the banks of Putah Creek. Melmoth's mother, Frances Stanley Riggs, was an Armstrong daughter who married Mort Stanley, former publisher of the Times Star. Melmoth and Walt both grew up in Middletown, were drawn away as young adults, but married and returned after spending some years in Calistoga. They lived in the Armstrong house until shortly after Melmoth's death, when Walt moved to smaller quarters.